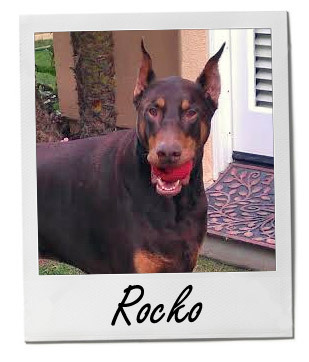 Rocko Fuerte Cruz is a six year old Doberman Pinscher living with icthyosis.We obtained Rocko from a breeder in California. As far as we know, none of his siblings have the disease. We had a health guarantee but that would mean giving him back to the breeder and I could not do that. Six years later here we are! Most animals with this disease are put to sleep as puppies but Rocko is living proof that with a healthy diet and a great vet you can successfully beat the odds. With a holistic diet, medication and frequent baths you cannot tell that Rocko has any type of skin condition. He is happy, healthy and incredibly playful. We hope that all dog owners recognize this icthyosis is not a death sentence but can be successfully managed.